Relationships Australia SA and the Australian Institute of Social Relations warmly invite you to a White Ribbon Fundraiser, the screening of “The Mask You Live In”, to support White Ribbon’s prevention programs in schools, workplaces and in the wider community. Violence against women is a serious problem in Australia. Our family, friends, colleagues and neighbours have a basic human right to be safe at home but sadly, for many, this is not the case. This award-winning documentary sends a powerful message about the struggles faced by young men in negotiating narrow but pervasive definitions of masculinity. The film also explores how the worst aspect of men’s cultures sets a context for violence in relationships and what is being done to shift this culture. We will be screening a half-hour portion of the film which will be followed by a panel discussion about the issues presented. All proceeds from this fundraiser will go to White Ribbon. 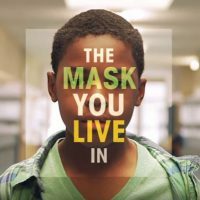 Watch “The Mask You Live In” trailer here. When: Friday, 25 August. 5:30-9:00 pm. Doors open 5:30 pm for a 6:00 pm start. Cost: All tickets are $15.00 and includes food, drink and entry into the door prize raffle. Please RSVP by Wednesday 23 August. For more information call us at 8245 8100.